Highlights from the day's games in the FA Cup fifth round. Browse content similar to Fifth-Round Highlights. Check below for episodes and series from the same categories and more! contains both Sanchez and Lukaku. fourth if this is a draw, of course. anymore. He held it up originally. appeals for hands there. Williams. Van La Parra. Blocked by Yonge. clear enough to give the penalty. making that a perfect delivery. final minute of the first half. referee's assistant got it right. And Neil Swarbrick says he didn't. And Mata's goal will not count. watched to make their decision. wasn't a straight line amongst them. Williams. Was he caught by Sanchez? Smalling only as far as Billing. Manchester United try and counter. Sanchez. What a fabulous Ball. Lukaku right the way through here. Can he get the shot in? He can! Belgian. No debate about that one. difference for Jose Mourinho's team. letters of VAR will be as well. in the game and I don't like it. they do get it right. got to the right decision. that will and must be tidied up. difficult for the linesman to see. game comfortably and this is why. Manchester United for Paul Pogba. Commentary comes from Robyn Cowen. Barry and Jonny Evans start today. and West Brom did not need. dangerous delivery and over the top. tough week for Alan Pardew. up. Safety first from Matt Phillips. had his first goal for the club. Hoedt. Krychowiak. What a say. fourth of the season. Expertly done. West Brom are in real trouble now. time. Powerful and on target. between Hojbjerg and Lemina. Barry. James McClean with the delivery. out? Very, very close from Hegazy. have turned, in terms of pressure. McClean. Forced to turn back. off the bar! Rondon, incredible! quite as certain as it was before. sort of thinking from your part? Well, that's not a decision for me. by the way, they were brilliant. ourselves a result in the league. game of it but it was anything but. centre half attacking a set piece. committed too many men forward. he has to win the second one. things down, having efforts on goal. it's tight timewise to do that well. are at the bottom of the league. obviously. Two down, more to come. woodwork! It must be. Van der Hoorn. and back to the 80s. in the competition this year. like to be beside the seaside. Colchester, their third in a row. has hit the woodwork on his debut. startling impact -- the far stick. quarterfinals since 1980s it is. he get the cross in early -- March. and he scores. 2-0, Brighton's lead. in his fourth game for the club. should have won. Here is March. hour played, Brighton 3-0 Coventry. Up to Clark Harris. Now Bayliss. unlucky. Now Josh Barrett. Haynes. deflected kindly here for Brighton. what you need in this type of game. set pieces, here is his goal. game. Outstanding debut for him. with new side Swansea City. a single defeat in 11 matches. Alistair Mann was at Hillsborough. Kyle Naughton taking his place. present in the cup so far. wingback. A positive start for them. till the start of the match. next few weeks for Swansea. Abraham. It is a good ball. the corner is cleared. Naughton. by -- goalkeeping by Cameron Dawson. Abraham. Good ball. No penalty. on the far side was unmoved. out from under his right boot. about to make a substitution here. in the quarterfinals of the FA Cup. have now had one late in the second. the liberty for a replay. what I have seen and also our fans. and this game is one extra game. just locked into Abraham in the box. little confused with the goalkeeper. well, which was fairly clear-cut. think this penalty well. Fox. as Rochdale take on Tottenham. as Wigan host Manchester City. for this year's People's Cup. Sign-up closes midnight on Sunday. and we kick off at the King Power. suspensions have taken their toll. signing who isn't cup tied. the space and just inches away. Mahrez, Vardy, the flag stays down. linking up again. Stays onside. City ahead against Sheffield United! his worth to Leicester City. lot of things had to go well for us. Jamie Vardy and Riyad Mahrez. this time the Spaniard puts it away. ball. Marshall cannot keep him out. Giroud is too strong for Stewart. away from Giroud and it is in. Zappacosta was so unselfish there. from Drinkwater but he kept it down. Chelsea. The tie long since decided. game we will see what happens. Willian, you want to focus on him. fantastic finish with his left foot. finds himself in a bit of space. foot, right foot -- Leon Osman. that's a no. Good night. -- not everyone's a fan. Tadic to wrap it up. 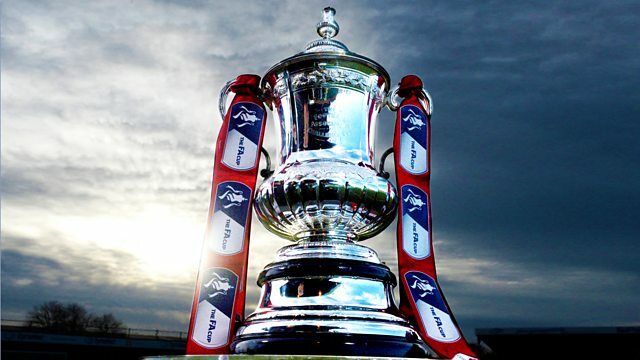 Highlights from today's games in the FA Cup fifth round. Last season, six Premier League sides progressed to the quarter-final, but the headlines belonged to then non-league Lincoln City, who won 1-0 at top flight side Burnley, and Millwall who saw off Leicester.